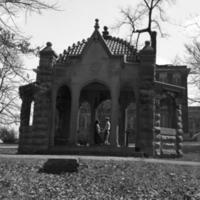 The Well House is one of the oldest structures on campus, and one of Indiana University’s most enduring symbols. In 1907 the University appointed a committee of trustees to assess the viability of moving the fronts and ornamental stone fixtures from the “Old College Building” and integrating them into a well house on the site of the cistern pump, located behind the current Memorial Union. Plans for the project were drawn up by Professor A.L. Foley of the physics department. 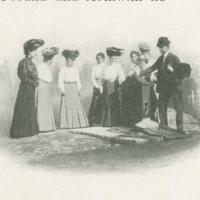 The committee, led by chairman Theodore F. Rose (class of 1875), was successful in this effort, in part because Rose funded the operation out of his own pocket. The project was completed in 1908. It is said that Rose modeled the shape of the eight-sided well house on his Beta Theta Pi fraternity pin. Rose dedicated the structure to his graduating class. At the time of its construction the Well House was a major source of water for the faculty and students of the University. When the roof of Wylie Hall caught fire in 1900, water from the Wells House was used to save the building. 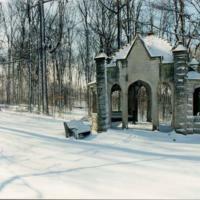 In addition to its practical purposes, the Well House has come to be a romantic campus location. After its construction it quickly became a popular student meeting place, and often the site of romantic encounters. Prior to its presentation to the University, the Well House was a frequented place of courtship. Standing equidistance from the men’s dorms, then located downtown and the women’s dorms situated where Jordan and Ballatine hall are presently located, it was a convenient halfway point for couples to meet. Originally couples were known to get engaged and “pinned” at the Well House. 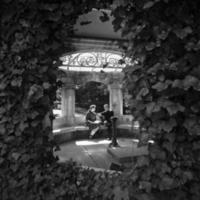 Eventually, kissing at the Wellhouse at midnight became a rite of passage for Indiana University students. The kiss had to last the duration of the full twelve strokes of midnight, (noon doesn’t count, notes the 1967 Arbutus). A woman was said to be a “true coed” only after this requirement was met. When the women’s curfew was 11pm, this could be a risky endeavor. The Well House was an important part of Indiana University culture. It is perhaps the most long-lasting student tradition, remaining popular for decades. The 1950 Arbutus declares: “Spring: the season when quarry attendance is greater than class attendance and when love hits campus so hard that couples need appointments to get in the Well House." 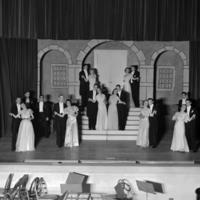 The student produced annual musical, the Jordan River Revue, had scenes set at the Well House in its 1938 production. 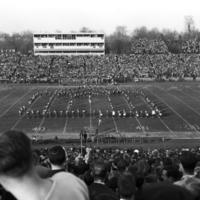 The University band would sometimes march in “well house formation” at sporting events, and for many years students eagarly awaited the “Wellhouse Waltz.” The first “Wellhouse Waltz” was held in 1944 at Alumni Hall. The midnight kiss was pushed back to 11pm, when the band would strike up a waltz and couples would pause in their dancing to engage with tradition. But as times changed and students were no longer subjected to a curfew, the Well House was not the fashionable courtship setting it had been during the early part of the century. 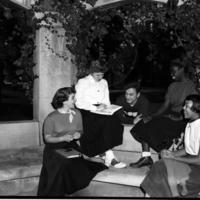 By the 1960s students were still aware of the tradition, but took part with less regularity as social mores changed. As the authors of the 1967 Arbutus maintained: "although an I.U. student today may appreciate the old traditions, he is rarely motivated to perpetuate them in the hustle and bustle of modern campus life. Couples still observe the Well House custom, but the majority go to the weathered, gray shelter only on a lark to break the monotony of party-going and studying or as a final resort after watching a movie with a dull date."